A beloved pastor, author political activist, evangelical leader, and founder of Liberty University, Dr. Jerry Falwell was a man whose faith in God fueled a vision that continues to be realized in extraordinary ways. Since opening on Dr. Falwell's 70th birthday in 2003, the Jerry Falwell Museum has continued to grow its collection of memorabilia about Liberty's founder with donations from family, alumni, and friends from around the world. The museum also houses a library of Falwell's writings, including books and personal letters. The Jerry Falwell Museum allows visitors to experience the life of one of the most significant Christian leaders of the 20th Century. 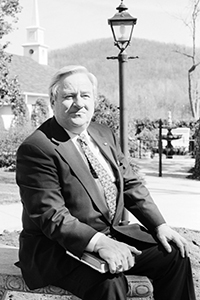 Come and learn about the incredible life and legacy of Dr. Jerry Falwell. "Faith is believing what God says in spite of circumstances. Faith is simply taking God at His Word." Begin your visit to Liberty University and the Jerry Falwell Museum with a stop at the Hancock Welcome Center to receive an approved parking pass to use during your visit. For more information, please contact the museum at (434) 582-7578.